Look for new socks in November! I’m happy to tell you that, although it has been a rocky road, I should have new socks exclusively in my online store in November and I’ll be able to offer them at the same $25 price as before. I originally announced that I expected to have new socks this month, but the factory I was working with ended up shutting down. I was afraid that once again I would have to give up on socks! But, recently, another factory in Nara, Japan – with whom we used to work – contacted me and said that they missed making our creative socks and wanted to work with me again. What’s more, they were able to resurrect machines that make my favorite double knit socks. And the good news doesn’t end there! 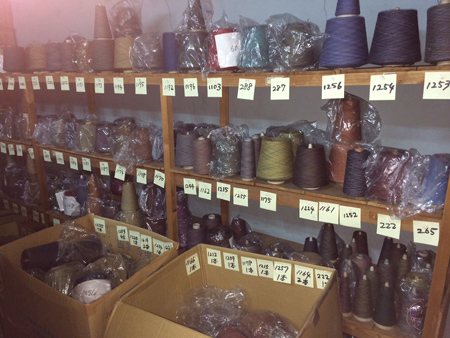 The Nara factory saved all my special yarns from the many years of working with them. Most factories would probably have dumped all that yarn, even though it was expensive. But I’m so glad they didn’t! Taking their lead, I realized I had lots of bits of yarn still in Japan, Italy, and China that I could reclaim before it went to a landfill. I had all that yarn shipped to the Nara factory, inventoried it, and used it to design my new socks. Recycling has long been a passion of mine, one that I always consider when designing any product. That this yarn didn’t end up in the waste stream is good news for us and the planet. The photo is of just some of the yarns we’ve been able to round up. Since the Nara factory is very busy (they have picked up a lot of business from the other factory we used to use), it will be November before we will get the new socks. I will post an update as soon as I get exact dates. This entry was posted in Fashion/Style on September 21, 2015 by jhane.